Poor Blackout. For a brief period last year I thought Call of Duty: Black Ops 4’s battle royale mode was going to take off. Blackout looked like Playerunknown’s Battlegrounds but played like Call of Duty—a perfect combination, I thought, for those who wanted a more grounded battle royale experience without all of PUBG’s jank. And then Apex Legends happened. Respawn’s battle royale folded in many of the same improvements as Blackout—more mobility, snappier shootings, better inventory management. Oh, and it was free. Turns out, it’s a lot easier to build and retain an audience when your game’s not behind a paywall, and while Apex Legends undoubtedly stole players from Fortnite and PUBG, it was Blackout’s distant third-place position that really seemed to be cannibalized overnight. 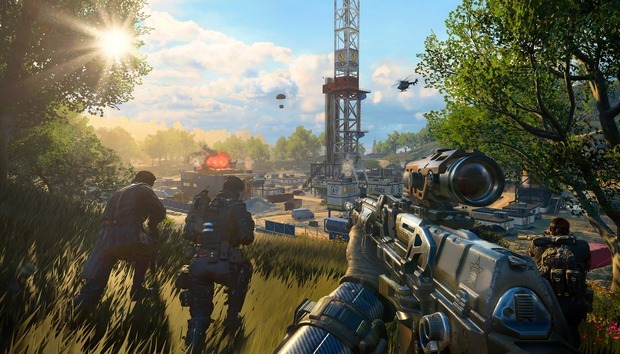 Cue this week’s news: Blackout is free for the entire month of April. Not free to keep, mind you. Activision’s calling it a “Free Access” window. Still, that’s an incredibly generous “demo.” These trial periods usually last a weekend or maybe a week, certainly not an entire month. I’d hazard this tells us two things. First, it’s confirmation that yes, Apex significantly hurt Blackout’s player base. You run this sort of promotion to try and shore up your server population and build hype again, especially in battle royale games where you need around 100 players per match. Two, I’d guess that Activision is toying with the idea of Blackout going free-to-play. First Blackout was confined to the traditional $60 version of Black Ops 4. Then Activision made a special $30 edition with just arena multiplayer and Blackout. Free-to-play next? It doesn’t seem like an outrageous scenario. Maybe April 30 comes and goes and Blackout’s still free. Maybe the “Access Window” ends on April 30, but there’s a pivot to free-to-play this summer. Or maybe it’s the next version of Blackout that gets the free-to-play treatment, divorced from Infinity Ward’s more traditional Call of Duty this fall. In any case, it’s worth checking out if you’ve got the time. I raved about Blackout last year. It’s faster than PUBG but more realistic and grounded than Fortnite, a sweet spot for me. There’s also a new map this week, which I’m interested in checking out. It’s set on Alcatraz, San Francisco’s famed prison island, which sits just a few miles away from me in the Bay. Close quarters battle royale is a unique premise, and the map looks like a faithful 1-to-1 reproduction with some very unique sightlines. And hey, it’s free. Might as well pop in. You can grab Blackout through Blizzard’s Battle.net client, and Activision says all progress will carry over if you decide to keep playing past April 30.